Within your organization there are multiple people working on different sides of the same problem. Making it easy for people to quickly and effectively share innovative solutions is a key enabler for more productivity, and better decisions. 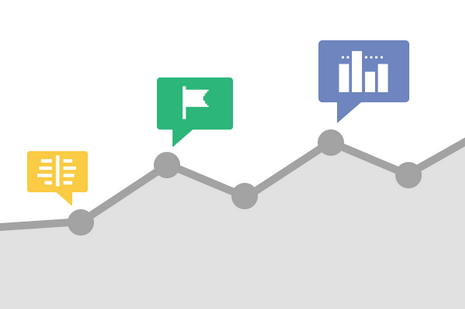 We are proud to announce a series of asset sharing tools within Google Analytics. To spread all your innovative solutions and assets even easier. Our permalink solution is a simple to use and privacy friendly way to share Google Analytics configurations across your organization, and beyond. Our popular segments feature helps you to narrow the focus of your analysis. Are you trying to answer a hypotheses for new, or recurring customers? Is this report more meaningful if you focus on a particular region? By sharing a segment, you share a certain point of view on a problem. Invite others to your view by sharing a segment you built, or a custom report. Goals in Google Analytics help advertisers to map real business value into a conversion signal. Track users site engagement, media interactions, or sales events through Goal tracking. Now it is easier than ever to share your success definition across other views, or with other people in your organization. It all starts with traffic to your website. You spend a tremendous amount of effort and resources on getting people to visit. Custom Channel Grouping within Multi-Channel Funnels enables you to identify everything, especially traffic that is custom to your business model. Sharing this important view is now easier than ever. Create a Custom Channel Grouping, and share this among your organization. Custom Attribution Models allow Google Analytics users to assign partial value to the channel interactions which drive business value. You invest time and effort to build a customized attribution model, which reflects the nuances of your business. Now it is easier than ever to ensure all stakeholders are working off the same consistent definition of attribution. Permalink is a simple to use, and privacy friendly way to share configuration assets. When you ‘share’ an asset, we are creating a copy of that asset or configuration, and create a unique URL which points to that copy. The asset copy will remain private and can only be accessed by someone with the URL. If you want to share your asset, just share the URL. The recipient clicks on the URL, and will be brought to a simple dialog to import the assets into his or her Google Analytics views. This feature also supports Dashboard, and Custom Reports. Check out our Solutions Gallery within your Google Analytics account via the “Import from Gallery” button or directly at the standalone site for inspiration, and consider sharing your own permalinks via the “Share in Solutions Gallery” link.